The best track car is often someone else’s car. You don’t have to do the work to get it ready. You just show up and drive. 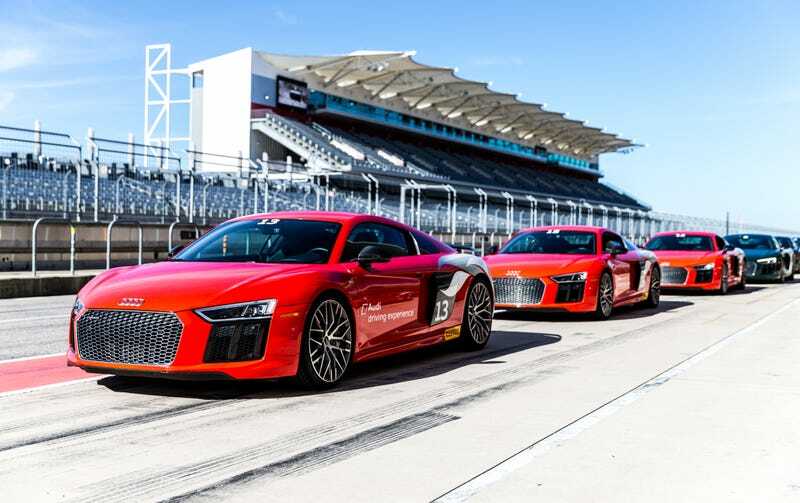 If you’d like to drive Circuit of the Americas without worrying if your brakes will work after that long straight, there’s now someone else’s Audi R8 V10 Plus waiting for you at the Audi Driving Experience. It’s a fun time. 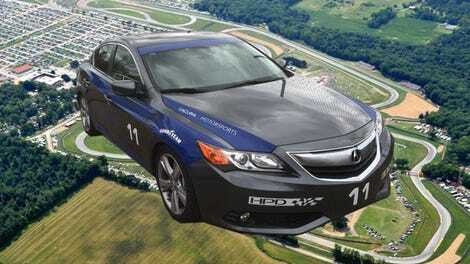 We tested out the half-day version of their Track Initiation program, which is meant to ramp up to faster driving, making it accessible even to people who hadn’t been on track before. There’s also a couple more advanced full-day and two-day on-track courses in the program for more experienced drivers, but we were there for the intro. And before they let you loose on the main track in an R8, you get to get your feet wet in a TT RS and an RS3. I think it’s fair to say neither of those are bad. The cost, all things considered, is not bad either: $995 for the half-day program that goes on track, $2,195 for the full-day “R8 Track Initiation”, and $4,995 for a two-day “R8 Pro Track Experience” event (which is more advanced and requires you to complete the full-day R8 Track Initiation program first). The long program even divides the track into halves, allowing you to drive the rarely-seen short course used in Australian Supercars’ single but wonderful trip to Texas. To put that in perspective, I’ve had single full days of track days in my own car at COTA cost around $300, and that’s towards the low end of what groups charge there. A supercar experience we reviewed at another local track started around $258 and that got you only three flying laps in a supercar. As far as dedicated driving schools go, each tier is a bit pricier than offerings elsewhere from, for example, Porsche in Alabama or Ford in Utah, but you do get to say you’ve driven the U.S.’s only current F1 track at the end of the day, which is neat. So, for the use of someone else’s R8 V10 Plus on a track that’s notoriously expensive to run on, the half-day program is not too bad, particularly for the surprising amount of in-car time you get. Even I found the short Track Initiation program to be pretty helpful, even though I have a couple race cars of my own. All my cars have been broken in some way lately, so I haven’t actually gotten to drive on track for far too long, which is supremely depressing. For me, this school ended up being the perfect reintroduction to track driving. I got to drive some cool cars I hadn’t driven before, and ease back into faster driving. The day started off with a couple exercises meant to get us used to being more aggressive with a car than we would on the street. First was a short autocross course in the TT RS, which had been made easier with the addition of lines drawn of where to go and more cones out on course defining the course. The instructors never sat in the right seat for the entire school, opting instead to give instructions over the radio. In that sense, maybe it’s better to get your first introduction to track driving somewhere with an in-car instructor who can promptly tell you to knock it off when you hold the steering wheel wrong, or are doing something else you shouldn’t do while driving. But for me, the radio approach was fine. The point was the same as any autocross: navigate the tight, twisty course as fast as you can (hopefully) without hitting any cones. Our last runs were timed, and the fastest runs were acknowledged at the end of the program. I wasn’t the fastest, and I hit cones. I burst out in laughter a lot while acknowledging that I sucked at this, though, so mission accomplished? The TT RS was also a gem—lighter, smaller and nimbler than the R8s we tried out later in the day, but still with a surprising amount of grip. We’ve been positive about the current generation of TT, and with a 400 horsepower 2.5-liter turbo inline-five and a zero to 60 mph time in the mid-three second range, the RS version is unsurprisingly even cooler. Oddly, I think I actually liked the TT RS better than the R8 V10 Pluses that were the featured cars of the program. It was still heavier than most of the cars I’ve autocrossed with a curb weight of 3,306 lbs., but it was the easiest to toss around out of any of the cars we drove. Hey, Audi: make more smaller, lighter cars. Next up were some braking and crash avoidance exercises in the RS3. Finally for sale in America for the first time, this four-door also gets that 400 HP five-banger, and it’s quite a machine too. First, we were told to accelerate as fast as we could, drag-race-style, lined up next to an identical RS3. There was one catch: we had to brake hard before a set of cones at the end, and the fastest person to brake at (not after) the cones was the winner. The other exercise in the RS3—meant to simulate avoiding an emergency “moose test”-style on the road—had us accelerate down a straight lane until the instructor called out which lane to take at a Y in the course. The RS3 has a surprising amount of grip, such that I really just needed to lift a little before making the turn on most of my runs. You just toss the RS3 in and it just seems to figure it out. This led to yet more giggling. Finally, we got to the track part of the “Track Initiation” program. After a brief chat back in the classroom where they told us about the R8 V10 Plus cars we’d be using, they cleverly split up the track into sectors. Here, we drove each sector several times behind the instructors as they talked through everything they were doing through a radio in the car. The half-day version we did just focused on the two most difficult chunks of the track instead of going through every sector, but it was still a fun way to take a closer look at the track. Our leading instructors started off slow, then gradually ramped up the pace, faster and faster, albeit careful not to leave anyone in the group too far behind. To go back to the start of each sector, we got to drive each chunk backwards, which is pretty rare for a track like COTA that’s set up to run in one direction at high speed. You’re sharing a car for this part, so you get to enjoy the cool view as a passenger at the top of the giant Turn One hill of the entire paddock and Austin’s skyline in the background, as that’s at the start of one sector. The instructors did take note of who was more comfortable behind the wheel during the sectors to split up participants by speed a little better for the full-track laps, which was pretty nice. Like the sectors, these full laps were done behind an instructor’s car and everyone was kept decently under the car’s limits. They were fun, either way. It also didn’t hurt that the instructor assigned to our lead-follow group was a longtime friend who knew that I would want to press the V10 noises pedal early and often—one of the joys of being a local, I guess. It’s worth noting that all of this is meant to enamor you to Audi’s sportiest offerings, just like any other manufacturer-backed event. They aren’t doing these things for charity. To that end, it’s probably the best place to try out an R8 or RS-car because you’re actively encouraged to wail on the cars, within some limits. You’re told how to open up the exhaust note on the R8 V10 Plus before you go out in the cars because they want you to hear it. The staff even referred to that louder option as the “happy button.” There’s no terrified car salesman yelling for you to slow down in the passenger seat. The little voice over the radio will probably actually tell you to push it a little more on the next run if you’re doing well. But this driving school also personally resulted in a whole lot of laughter. My face muscles actually hurt a couple times during the event because I hadn’t felt such joy in a while. While they never let you have free reign to push the car as much as you might want to, classroom time is kept brief and you do get a surprising amount of time in the cars. If you also need to escape the sick, sad world, you should really consider doing so in someone else’s Audis. Correction [3:19 p.m.]: As several of you noted on Audi’s and Circuit of the Americas’ websites, there were four programs, not three, and the one I did sounded like a more expensive $995 program. So, I called to double-check which price list was correct. Per COTA’s contact for the program, the flyer I had picked up at the event had older information from before they had finalized the structure of the school. Thus, this information has been corrected with the current pricing above. There is a $595 “Dynamic Experience” program, however, it’s all on the autocross courses that let you toss around the TT RS, RS3 and Q7 without using the track save for a lunchtime parade lap at the end of the course. A COTA representative said that it’s something they can offer even when the main track has been rented by another group. All of these programs can booked at COTA’s website here.